The chart and other related information can be found here. On Saturday, Conservative Treehouse posted an article about an aspect of the federal budget under President Obama that you may not be aware of. 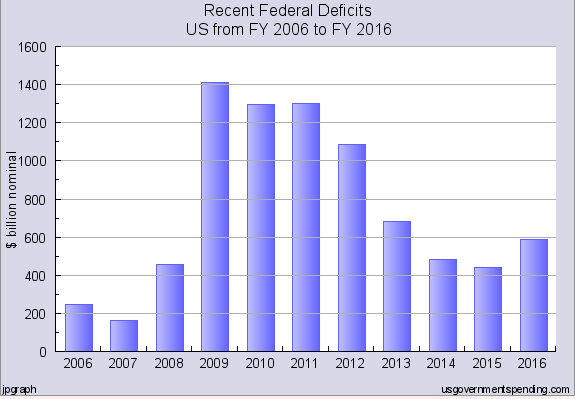 The last federal budget was signed into law in September of 2007 by President George W Bush for fiscal year 2008. Since then the entire mechanism of the federal government has been carried out by continuing resolutions, raises in the debt ceiling, and unfettered spending. Absent of an actual federal budget, all spending falls under a process called base-line budgeting to determine allocation. Federal distribution of the money within the continuing resolution, is essentially a year-over-year expenditure with a statutory increase based on inflation. Essentially, whatever was spent in 2009 was respent in 2010 along with a little bit more. What was spent in 2011 was a little more than ’10, and so forth. In February 2009 congress passed the American Recovery and Reinvestment Act, or ARRA, commonly referred to as Obama’s stimulus plan. The stimulus was just shy of one trillion ($986 billion +/-). At the time of passage this single stimulus expenditure reflected a growth of approximately 20% in total federal spending. The spending went directly into the deficit. Approximately 30% of that “one time” trillion dollar stimulus was spent in 2009, the remaining 70% was spent in 2010. (*note fiscal years run from October 1st to September 3oth annually). However, absent a federal budget -and because of baseline budgeting- it became a repeated expenditure in each of the following fiscal years. The $1 Trillion Stimulus was spent eight more times. The article points out that most Americans cannot tell you what the stimulus was spent on. President Obama put money into the Department of Education to subsidize state education and teachers’ salaries, keeping the teachers’ union happy. The key point is the $1 trillion 2009 “stimulus” funds, became a tool for President Obama to use in whatever cabinet office need he saw. So long as congress never passed an actual budget (and the traditional budget appropriations process kicked in), he would always have this massive amount of extra money to play with. Obama, Pelosi and Reid ensured there was never going to be a budget. As the economy somewhat gained footing (2012), for the last several years a lot of the money appears to have been spent on propping up ObamaCare and hiding the structural financial collapse. If Obama didn’t have this extra $1 trillion at his disposal, ObamaCare would have already collapsed. If you were wondering why ObamaCare didn’t collapse, well, there’s your answer. This scheme worked brilliantly so long as Team Obama could kick-the-budget-can into successive years. They did. …Remember: #1) Obama’s trillion stimulus was a +20% jump in federal spending which has continued year-over-year since 2009, #2) most of that money is now spent on propping up Obamacare via the insurance corridor reimbursement program. …That $1 trillion in annual expenditure is what initially kept government at full size when originally passed in ’09. It then transmogrified into a slush fund two fiscal years later, and ever since about 2012 it’s been a way for Obama to fund his priority list – and the UniParty congress has done nothing about it; because, well, essentially, congress agrees with what it’s being spent on. It’s a staggering amount of money, $986 billion. If Trump/Ryan eliminate the worst aspects of ObamaCare they can save a massive amount of that expenditure. However, beyond that – it shows you just how much money can –and hopefully will– be cut out of government by that elimination alone. It would be wonderful to have a Congress and a President who want to bring federal spending under control, but I am not convinced yet. Paul Mirengoff at Power Line posted an article yesterday about Kay Hagan, who is running for a second term in the United States Senate. Senator Hagan is the junior Senator from North Carolina. At the present time, she leads her opponent, Republican Thom Tillis, by three to five points. However, it appears that Mrs. Hagan’s husband’s company benefited from the stimulus bill she supported. But Hagan suffered a blow over the weekend when it was revealed that, by virtue of the 2009 Stimulus Bill for which she voted, her husband’s company received nearly $390,000 in federal grants for energy projects and tax credits. Hagan’s response to this story is that she did not help her husband win the federal funding. She also disputes any suggestion they have profited from the Stimulus. As to the first claim, it may be true that Hagan did not intervene directly on her husband’s behalf. But soon after voting for the Stimulus, she told a North Carolina newspaper that “there’s a lot of renewable energy-generating capacity in the stimulus package.” Her husband’s company was in the renewable energy business and Hagan knew that it was a potential direct beneficiary of the Stimulus. As to the second claim, it’s implausible to believe that the husband’s business did not profit from receiving almost $400,000 in federal grants and tax credits. According to Politico, the Hagans’ income from JDC Manufacturing increased from less than $201 in 2008 to nearly $134,000 in 2013. We need to elect people who will put the welfare of America ahead of their own personal gains. Obviously, Mrs. Hagan had a vested interest in voting for the stimulus. Breitbart.com posted an article today about a windmill at the Veterans Affairs Medical Center in St. Cloud, Minnesota. The windmill was constructed with $2.3 million in federal stimulus funds and has been “inoperable” for one and half years. The article also notes that no one has even attempted to fix the windmill. Would You Trust These People With Your Investment Portfolio ? Yesterday the Daily Caller posted an article about the investments the Obama Administration has made in alternative energy companies. The Romney campaign later clarified that he was talking about the DOE’s 1705 loan program which doled out $16.1 billion to green energy companies, accordingto the Washington Post. Of the 33 companies that received 1705 loan guarantees, only three have declared bankruptcy. The blog Green Corruption’s “Obama green-energy failure” list contains 23 bankrupt and 27 troubled green energy companies which were backed by the federal government. This list uses data compiled by the Heritage Foundation, but also includes some things the conservative think tank doesn’t. According to the Heritage Foundation, $80 billion was set aside in the 2009 stimulus package for clean energy loans, grants, and tax credits, and 10 percent of these funds have gone to companies that have filed for bankruptcy or are in dire straits. As I have said before, I believe there will come a day when green energy makes sense. I also believe that day will come after the free market has culled out the technologies that do not work and the technologies that do work have naturally risen to the top of the pile. Government subsidies interfere with that process and actually slow down the successful development of green energy–not to mention the amount of money the government has lost in picking winners and losers (mostly losers). As taxpayers, we have the right to invest our money where we chose to invest it. There is nothing in the Constitution that gives the government the right to make investments in green energy for us.